Let the candidates in your area know that cycling matters. Share the Road has developed several resources to help you talk about cycling during the 2018 elections, and year-round. 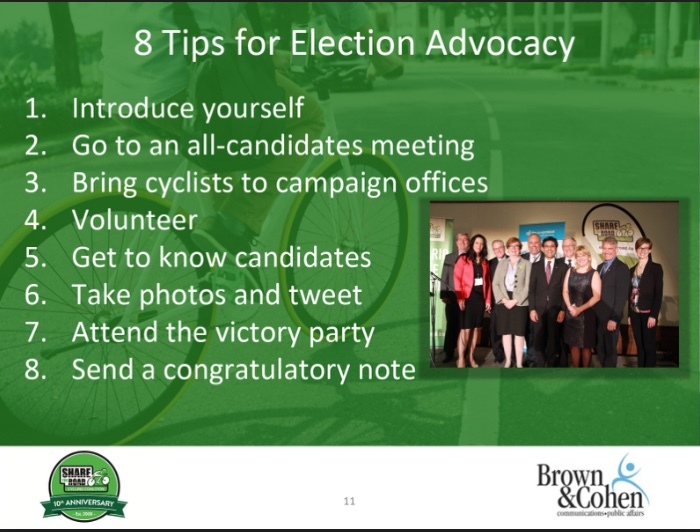 What can you do to ensure that your candidates know that cycling matters? You can start by inviting all candidates out on a bike ride. You could also distribute a candidates survey about cycling, or submit an op-ed to your local newspaper. No matter what you choose to do, take action and show your support for cycling. The resources below can help you get started. An overview of Ontario's political system. Click here for a digital copy of the Advocacy Toolkit. Template for a newspaper op-ed in your community. Click here for a digital copy of our Advocacy Templates. Members of the Queen's Park All Party Cycling Caucus participate in a bike ride to celebrate Bike Month.